Video: Most of us have probably seen mobile swimming pools before, even if it was just on The Simpsons, but none quite like this. Usually the pool element has its own separate section on the back of a truck or limo. The team over at Garage 54 have taken the concept a few steps further by converting an entire Volvo 960 cabin into an open-air swimming pool. While the finished product is great to see, it's really fun watching the conversion process — especially the addition of what seems to be a hand-controlled brake and accelerator (since the driver is also sitting in water from the waist down) as well as moving the gear shift higher up. We recently wrote about a Russian YouTuber who created a rubber chicken exhaust mod, and he instantly became our new hero. As it turns out, his entire channel is pure gold. 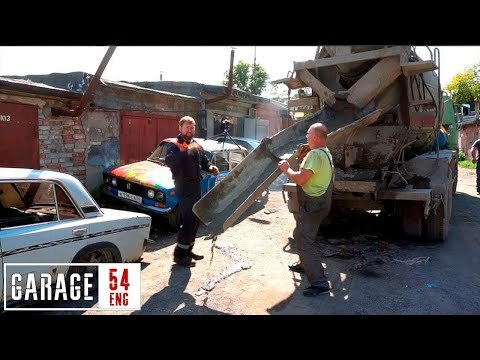 In his latest video, he pours 5 tonnes of concrete into a car to see if it will still drive. You can watch more of the exploits from Garage 54 right here.